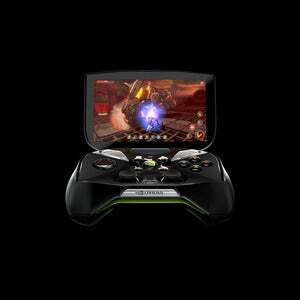 Nvidia’s CEO showed an updated version of the company’s Shield portable gaming device at the Computex trade show Tuesday, and said it will start shipping the device later this month to customers who pre-ordered it. “The basic architecture is the same. Some of the industrial design was enhanced, it feels more solid. You can really fight it, it feels very rigid,” he said. Nvidia CEO Jen-Hsun Huang holding Shield. 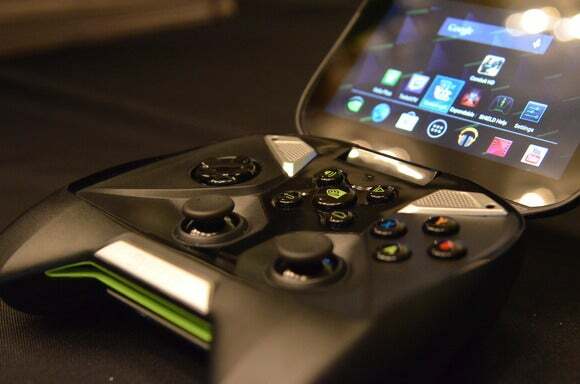 Shield is based on Nvidia’s new Tegra 4 processor and runs the Android OS. It marks Nvidia’s entry into the portable gaming market, where it will have to compete with Nintendo and Sony, as well as with tablet and smartphone makers. It’s a new business for Nvidia and the company is taking the introduction slowly in order to make sure it does it right, Huang said. It won’t sell the product internationally until it gets the sales and support model nailed down in the U.S.
Last month, Nvidia said Shield would be available for pre-order on May 20, priced at $349. The pre-orders have been “very limited,” Huang said, but he said it’s because Nvidia didn’t want to market Shield heavily until it knew it could manufacture and deliver it. “Later this month we’ll go very broad” with the marketing, he said. The company will start to ship the device to customers who preordered it at around the same time. He showed a state of the art game running on a PC with Nvidia’s new GeForce GTX 780 graphics card. A TV wouldn’t have the GPU power to render such a game, but still people might want to play the game on a screen in another room in the house. “The remote graphics needs to be very fast and the latency very low. There needs to be a software receiver that’s also very low latency, managing the quality of service between the PC and the TV,” Huang said. It was only a demonstration, and Huang didn’t say when the remote streaming system might be offered in product form. It’s all part of a plan to usher in the “multi screen world,” according to Huang. With an application processor, Android and the cloud, all screens—be they TVs, laptops or the display in the back of a car—will be able to play video games, music and movies, he said. “You’re life is pretty much in the cloud now, so any display with an application processor and Android suddenly becomes very useful,” he said.